1.Plug and plau:Directly plug and play, no any driver or software. 2.Digital screen display channels, channel selection is convenient and intuitive. 3.Support 8 Receiving Channels with 2.4GHz:. 5.Supports PAL/NTSC audio and video transmission. 6.The transmitter supports 1 RCA audio and video signal input, the receiver supports 1 RCA audio and video signal output. 7.In the case of a co-channel, the transmitter and receiver can be used simultaneously by one to one or one transmitter to multiple receivers. 8.Support 433MHz infrared remote control signal wireless return, compatible with 38KHz infrared carrier remote control signal. 9.The transmitter comes with an infrared signal or uses an infrared signal extension cable. 10.Aluminum alloy shell, superior heat dissipation effect, effectively guarantee the working time and the life of equipment. 100% Satisfaction Guarantee : If you are not completely satisfied with our wifi av transmitter just contact us , we will try our best to give you a satisfactory solution! Exclusive wireless anti-jamming patented technology : Teepao av wireless sender could effectively blocks radio signal interference such as phone,speaker ,wireless routers and so on. Support 8 Receiving Channels with 2.4GHz::You can select these channels to avoid interference from signals of a wireless router, etc. Unimpeded transmission distance up to 300 M (985FT). Supports wall transmission. Widely application:Our av wireless transmitter can transmit AV signals of DVD, DVR, CCD camera, IPTV, satellite set-top box, digital TV set-top box and other similar devices by means of radio waves and receive them at distant end and input them to a TV set to be displayed. 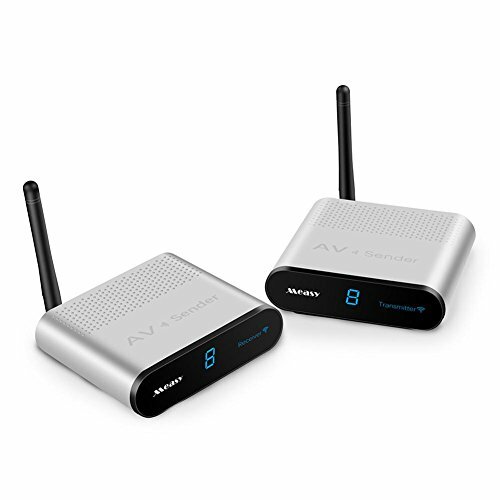 Wireless Audio Video AV Transmitter Receiver Sender Set :A Reciever and a transmitter ,great to built-up your own wireless system.Video signal system: PAL/NTSC. Easy to use: Our av transmitter with full hardware design, directly plug and play, no any driver or software.Digital screen display channels, channel selection is convenient and intuitive.